As I noted when the 1/35 scale version of this vehicle came out, one of the problems with very long tank guns is that they tend to cause problems when crossing rough terrain or moving in cities. Studies by all armor producing nations show that too often a long gun barrel digs into the ground with unpleasant results for the crew and the tank. The solutions were either use a shorter gun – which then tended to limit the firepower and armor penetration capabilities of the tank - or move the turret farther back on the chassis. This solved the problem of overhang but also caused problems with balance and visibility, creating larger “dead ground” spots in front of the tank that the crew could not protect with turret armament. Towards the end of the war when the Germans had moved to bigger and longer guns they began to experiment with rear-mounted turrets. 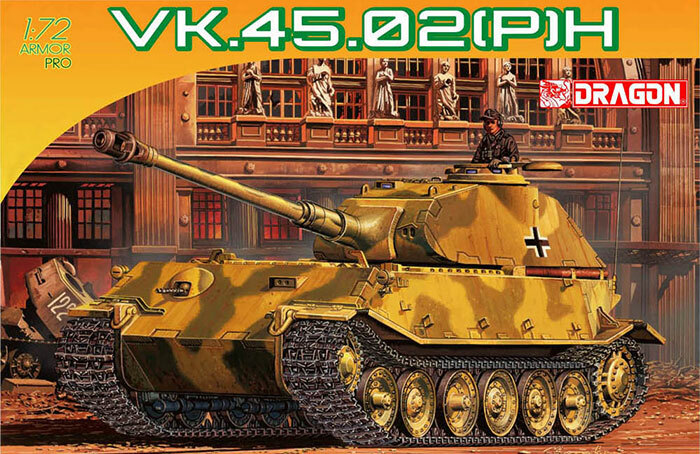 The two design iterations of the VK.4502(P) prototype tank looked at both versions dubbed “V” (for “vorwarts” - forward ) and “H” (for “heckwarts” - rearward). While neither version ever appears to have gotten into more than early production and testing, it shows the design evolution of these tanks (and why the “Maus” and “Loewe” tanks used the rear mounted turret). 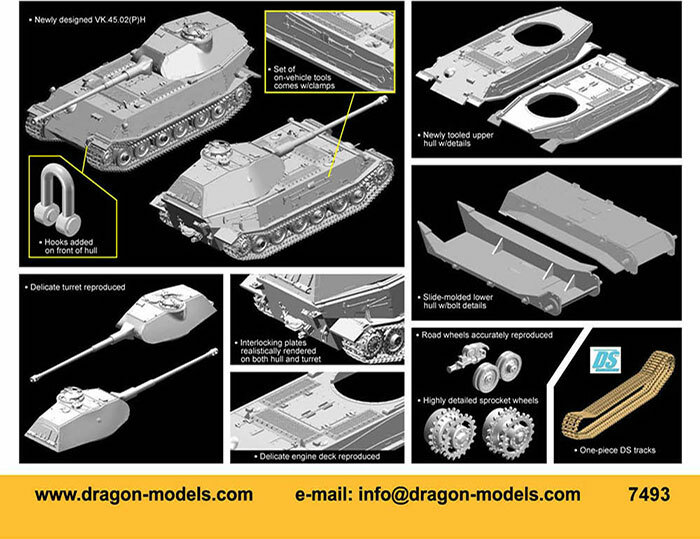 DML has now released the H version of this prototype in 1/72 scale and it is a neat little kit. Some parts appear to be modified from earlier Tiger II Porsche turret and Elefant/Ferdinand kits but most appears new mold. The kit has no etched brass which is debatable, as it was only a prototype and no final production variants were produced. The tracks are similar to the Elefant tracks and are noted as being 203mm long; the ones in this kit were 202mm so will need a bit of stretching. No consultants are listed, but Tom Cockle and Gary Edmundson were the ones for the 1/35 scale kit. Your choice of finishing is simple: “Unidentified Unit” in either overall sand brown or a two color green/sand finish, both of which are presumptive. Eight crosses in two sizes are provided on a tiny Cartograf sheet. Overall if displayed with the first variants it provides an illustration of the direction German tank design was taking in the latter half of the war. As it compliments the first one, it also should fit in with a collection of Tigers very well.